I didn’t learn about s’mores until I was an adult. We weren’t a camping family, though toasting marshmallows was an occasional but revered treat growing up. How I survived into adulthood without the melty, sticky joy of toasted marshmallows and chocolate smushed between graham crackers in my life is a mystery. 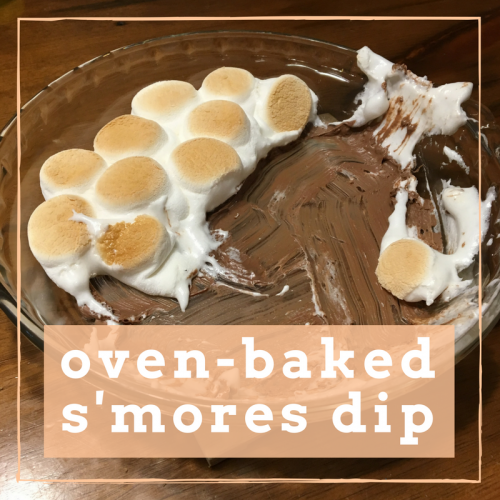 I saw a variation of this fire-pit free oven-baked s’mores recipe online, and adapted it to what we had on hand one day when I was looking for a quick treat for the kids. Yes, of course it was for the kids. Lucas loved it so much we had s’mores instead of birthday cake for him one year. I think it might even be easier than the authentic version! You’ll need a bag of marshmallows (we use the big ones, but not the giant ones), a bag of chocolate chips (we used milk chocolate, for the classic s’mores flavour, approximate bag size 270 grams) and a box of graham crackers. This recipe is ridiculously forgiving – use skor chips, rainbow marshmallows and bacon dippers if that floats your boat! You’ll also need a baking dish. The original recipe I saw used a cast iron pan, but my version pre-dates my cast iron pan ownership, and now that I do own one, I’m not sure I’d want marshmallow glue glommed all over it. I use a pyrex pie plate, but just about any baking dish approximately 8 to 9 inches across would do the trick. Preheat your oven to 400F and move your rack up to one of the higher levels. 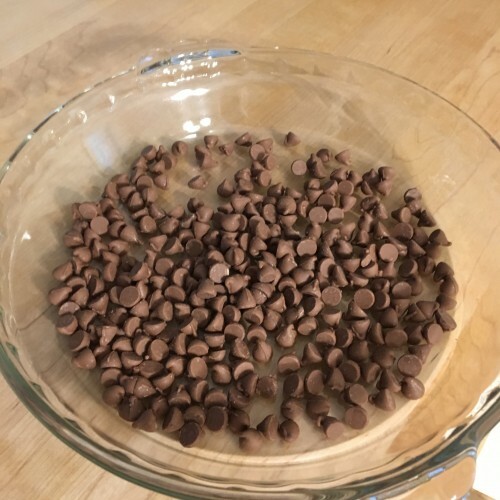 Sprinkle half the bag of the chocolate chips into the bottom of your baking dish, distributing them more or less evenly across the bottom of the dish. Add a few more, and maybe eat a couple when the kids aren’t looking. Now place the marshmallows on top, flat side down, touching each other. It took about half a bag to fill the pan. Place the dish in the oven and WATCH IT CAREFULLY. 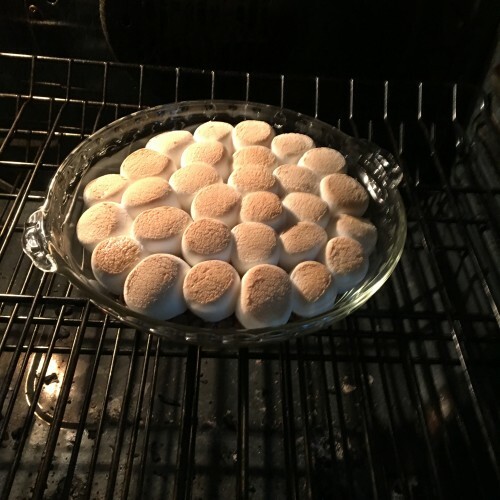 It will only take a few minutes for the marshmallows to start to puff up and toast on top. You want to hit the sweet spot (pardon the pun) where the marshmallows are toasty on top, gooey in the middle, and the chocolate chips are melted. Five, maybe ten minutes, but seriously, don’t take your eyes off them or the whole thing will burn. Ask me now I know! Take it out of the oven and serve immediately. Serve with graham crackers for scooping and dipping. We were so keen to eat ours that I entirely forgot to photograph this important step. My kids each have a different approach on how to eat this. 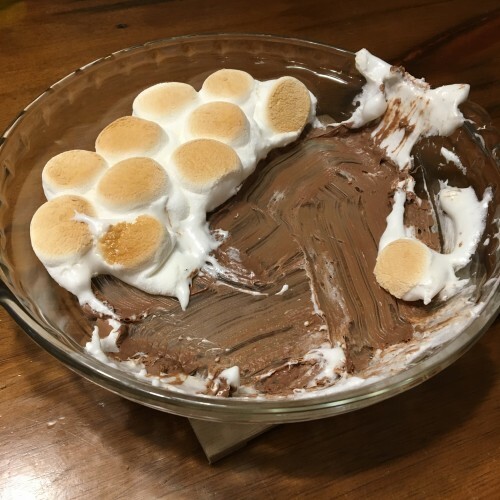 One dips his crackers like chips in dip, but another scoops and uses a second graham cracker to make a more classic squashed and sticky s’mores experience. Make sure you scoop deeply enough to get some chocolate with each bite! CAUTION: the dish is very hot. You may want to scoop some out on to a separate plate for really little fingers. This is the simplest dessert I know, and one of the boys’ favourites! Let me know if you try it. It’s a great way to have the summery flavour of s’mores all year long!